This year, we celebrate 20 years since the passing of the Human Rights Act, the landmark piece of UK legislation that has been protecting human rights, and in particular the rights of LGBT+ people, in almost every walk of life since. 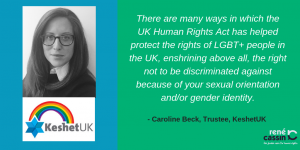 There are many ways in which the UK Human Rights Act has helped protect the rights of LGBT+ people in the UK, enshrining above all, the right not to be discriminated against because of your sexual orientation and/or gender identity. Shana Tova u’Metukah (Have a good & sweet year). We are full of hope for 5779 & excited to continue working with schools, youth & young adult organisations, synagogues & the wider community to create a world where no one has to choose between their LGBT+ & Jewish identity. But just how important this is was underlined to me recently, with the retirement of US Supreme Court Justice Anthony Kennedy, and the subsequent appointment of Brett Kavanaugh to replace him. Much was written about Kennedy’s legacy in advancing and protecting LGBT+ rights, and how his retirement – and Kavanaugh’s selection as his replacement – was a major setback for LGBT+ and human rights. With Kennedy’s retirement, the sustainability of the progress he has helped to make is in jeopardy. Not only because there is now a conservative majority on the Supreme Court Bench, so that Kennedy’s swing vote was no longer in play; but because in the US there is no federal legislation protecting a set of inalienable human rights, giving greater weight to Kavanaugh’s personal outlook, which will directly impact the extent to which LGBT+ and other rights are protected. For example, in 2014, President Obama signed an executive order making it illegal for any company working on Federal government funded projects to discriminate against LGBT+ workers. Whilst positive, the reason he did so was that the US Employment Non-Discrimination Act (ENDA), designed to prevent discrimination in hiring and employment on the basis of sexual orientation or gender identity, was (and still is) stuck in Congress. Those opposing the Bill expressed concern that the freedom of employers would be curtailed. I recall a BBC journalist covering the story at the time seeming baffled by the outcry. Surely, outlawing discrimination is just basic human rights, right? Not right. Or rather – not a right. Whilst race is a protected characteristic in the US constitution, gender identity and sexual orientation are not, and whilst freedom of expression is a basic right, it is up to the US Supreme Court to rule how this the exercise of this right is interpreted. In contrast, the UK Human Rights Act, and the European Convention on Human Rights (ECHR), which sits behind it, protects the rights of everyone to have a family, and not be discriminated against. So, for example, in the UK in 2004, when a landlord attempted to repossess his property following the death of his tenant, the tenant’s gay partner claimed his right under Article 14 of the ECHR, not to be discriminated against because of sexual orientation, since husbands and wives could inherit from each other. He argued that under Article 8 of the ECHR the state was obliged to protect his family life, and won. There is more to do to protect the rights and equality of LGBT+ people and their families in the UK, and the recent debate around reforms to the Gender Recognition Act has highlighted the need for better legal provisions and protections. But when we compare the rights and protections LGBT+ people and their families, and all of us enjoy here in the UK, with those in the United States and around the world, we have much to be grateful for.